Spring is (almost) here, which means that many of us in the northern midwest are able to see what was buried beneath all that snow. Getting outside and seeing the grass and sidewalk (and potholes) for the first time in ages can be eye-opening for sure, but as long as you’ve got those eyes open, you might as well look at the state of your roof. Here are some things to examine to determine whether or not it might be time for a replacement. 1. Got Shingles? – The winter can be devastating for sure, and it might have done some real damage to your shingles. 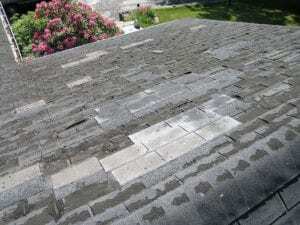 If you’ve got missing, damaged, or crumbling shingles, then there might be more damage underneath. If your shingles are in poor shape, or if you’re noticing shingle granules in your gutters, it’s probably time to contact a roofing expert like MXI to determine how deep that damage might go. 2. Check the Attic – You might not see any clear and present damage to the exterior of your roof, but that doesn’t mean there isn’t something hidden beneath the surface. Climb up into your attic and check for light leaks, water damage, stained rafters, or any level of mold or rot. Mold and mildew caused by ice or water leakage can wreak havoc on your home, so it’s best to get it taken care of before it gets out of hand (and lots more expensive!). 3. Energy Inefficiency – One way to tell if your roof might be in need of replacing is not to even look at the roof at all… but at your energy bill! If your energy costs are abnormally high, you might have holes or insufficient attic ventilation, ultimately causing decay and rot. Those are both things to avoid at all costs, lest they become major costs! 4. It’s Old – Face it: your house wasn’t built yesterday. The older your home is, the more likely it is that you’ll need to do some major overhauls. Luckily, the roof is a place to start that can make some of your other updates easier and less costly. If you notice areas of your home that seem to be falling to bits, the roof most likely could use an update first and foremost. 5. You Think You’re Ready For It – Despite factors that deem a new roof necessary, such as those listed above, you might need a new roof because YOU think it’s time. If you’re ready to make some changes to your home, a new roof can really give it new life. Besides, part of taking care of your roofing needs is being proactive– don’t wait until it’s too late. If you’re experiencing any of the issues here, don’t hesitate to contact Modern Xterior Improvement. We’re not only experts when it comes to roof repair and replacement, but we’re also honest, dependable and thorough. Contact MXI today for a free quote, or if you just need some sound advice when it comes to roofing replacement and repair.